Short but very strenuous hike, climbing almost 1,100 feet in 1.6 miles, utilizing switchbacks and stone steps on a heavily used trail. It is a very steep trail, loose rock, and netting in place for erosion control. The trail starts in the bottom of Kyle Canyon, which at this point is deep, heavily forested, and surrounded by beautiful gray limestone cliffs. 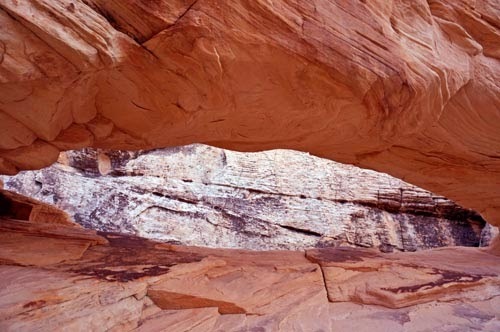 There is a nice size cave along the north cliff, to the left of the falls on the left; with an easy to follow path leading to the mouth of the cave. There is another one about 400 ft farther out the trail past the falls. This cave has some flowstone, broken cave curtains, and tiny stalactites. 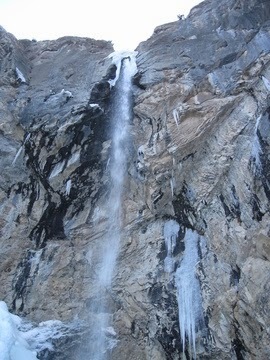 From the base of the falls you can see Big Falls and Charleston Peak in the background. This is a pretty trail with ponderosa pines, white fir, aspen, and mountain mahogany. Look for deer and fox in the aspens at sunrise and sunset, near the beginning /end of trail.